Anderson Silva is a Brazilian middleweight MMA fighter. He is known for holding his title for longest time in UFC history. Who is Anderson Silva, how old is he, when is his birthday, how tall is he, where is he from and what is his background? Anderson (Spider) Silva is a Mixed Martial Arts (MMA) fighter. He was born on April 14, 1975 in Sao Paulo, Brazil and is 44 years old. He is 1.87 metres tall. Coming from a very poor area in Sao Paulo, Silva’s family could not afford to pay for him to have martial arts lessons so he learned Jiu-Jitsu by watching other children train. He started formal Taekwondo lessons at the age of 13 and worked at McDonalds before he became a professional fighter. Why is Anderson Silva famous and what is his occupation? Anderson Silva is a MMA fighter. He held the longest title streak in UFC history, (2,457 days), holding the middleweight title for almost seven years. What is Anderson Silva’s net worth? According to FIGHTSTATE, Silva is the third richest MMA fighter, with a net worth of $18million. How much does Anderson Silva earn? Fights Day reported Silva earned $665,000 for his February 2016 fight against Michael Bisping. This included his fight fee, a ‘Fight of the Night’ bonus and $15,000 sponsorship from Reebok. Later the same year, he earned $620,000 for his bout with Daniel Cormier. He was also sponsored by Burger King. How much does Anderson Silva weigh, what weight class is he in? 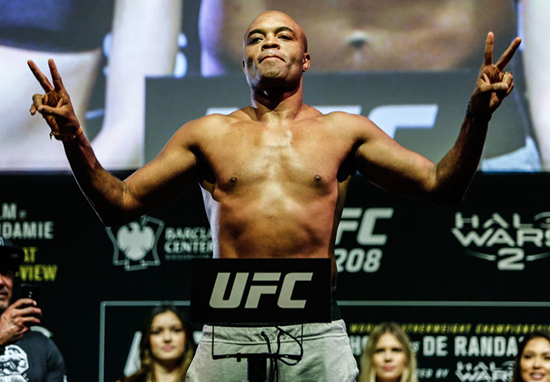 Anderson Silva weighs 185 pounds or 84kg. He usually fights as a middleweight but has fought at light heavyweight as well. Who has Anderson Silva fought in boxing matches, when is his next fight how many fights has he won, what are his most famous fights? Silva has had 43 fights with only eight losses and one no contest after his win against Nick Diaz was overturned due to a positive drugs test in 2015. After winning his first UFC match in 2006 fans were asked to vote for who his next opponent should be and they overwhelmingly selected Rich Franklin. During the fight in October 2006, Silva broke Franklin’s nose and went on the win the fight and so was crowned UFC middleweight champion. SHANGHAI // 25.11 Quem está pronto? Cadastre-se na lista de email do @spiderkick, clicando no link da minha bio para receber notícias sobre a luta de 25.11. VAMOS LÁ! . SHANGHAI // 11.25. Who's ready!? Subscribe to the @spiderkick mailing list by tapping the link in my bio for all news on the 11.25 fight. LET'S GO! Silva continued to defend his title but his fight against Maia in Abu Dhabi, in April 2010 was controversial. Although he won the match on points, he was widely criticised for avoiding engaging with Maia. He later apologised for his attitude. In August 2010 Silva faced Sonnen and for most of the fight Sonnen dominated, but in the fifth round Silva used a Triangle Arm Bar to force Sonnen to submit. In July 2013 Silva’s reign as UFC middleweight champion came to an end when he was knocked out in the second round by Chris Weidman. They had a rematch in December 2013 but Silva suffered a TKO after breaking his tibia and fibula. He returned to UFC in 2015 with a fight against Nick Diaz and won the fight, but the result was overturned when he tested positive for steroids. He would later claim he’d taken drugs to improve his sexual performance and these had been tainted with a banned substance. He was banned for a year and returned to the sport with a bout again Michael Bisping in early 2016. Bisping won this match on points and the bout won Fight of Night. He then lost to Daniel Cormier in a UFC light heavyweight match before beating Brunson in a tight match in February 2017. Silva failed another drugs test at the end of October 2017 and his career is now on hold. He’s said on Twitter he’s working closely with authorities to understand why he tested positive. E lá vamos nós ????????????????? ?alegria alegria' . Here we go! Fun fun fun! How long was Anderson Silva champion for? Silva was middleweight champion for 2,457 days, which is 6.73 years. Has Anderson Silva retired, what happened to him, what’s next for him, is he still fighting? Anderson Silva has not retired. After a positive drugs test in October 2017, he was withdrawn from his next scheduled fight in November 2017. Investigations into his positive drug test are ongoing. Does Anderson Silva have any children? Anderson Silva has five children with wife Dayane, sons Gabriel, Joao Vitor and Kalyl and daughters Kauana and Kaory. Is Anderson Silva married, who has he dated in the past, was he married? Anderson Silva’s wife Dayane is a former gymnast and they have five children.